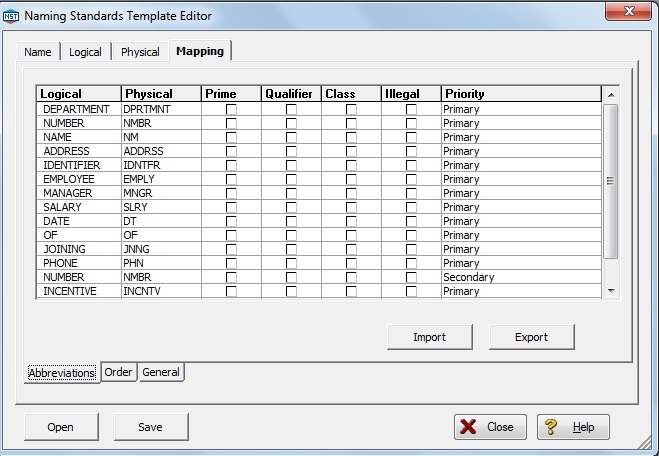 How To Create Naming Standards In Embarcadero’s Data Architect? Create a .csv file named “Naming_Standards.csv” and store the following information in that csv file. The reason for creating this file is to avoid errors and typos in our naming conventions and data modeling naming convention standards can also be followed. We have eliminated VOWELS in the actual word so that physical object names will not exceed the actual length provided by the database. Later this file will be created in .nst format (embarcadero’s naming standards format) and has to be attached to the physical data model that we will create in the next section. This file (.nst) can be attached to all data models created across the enterprise. Note: We are not providing naming standards for logical data model. Open your Microsoft Excel and type the following data. Then store it in .nsv format. Click menu Tools/Naming Standards Template Editor. On top of the screen, there are four different tabs. Name, Logical, Physical, and Mapping. Under name tab: type the file name as enterprise_naming_standards. Under Logical tab, you can change max length of entity, attribute, view, key, relationship. Select case as upper for entity. Under physical tab, you can change you can change max length of entity, attribute, view, key, relationship. You have to change the length as per the target database standards. Select case as upper for table. Under mapping tab, click import. Select the file “naming_standards.csv”. In mapping tab, below the screen there are three tabs abbreviations, order, and general. Click general tab. Since we will be placing underscore between each word of the column, type “_” in physical word separation under heading “delimiter options”. How to create a physical data model from a logical data model using Embarcadero’s Data Architect? How To Create A Logical Data Model In ER Studio Data Architect? How to add identifying, non-identifying, self-recursive relationship in ER Studio Data Architect?